Christine Clay (Pamela Carme) is a film star on the rise. Her husband, who has apparently been away for several years, accuses her of cheating on him with other men. A fiery confrontation during a heavy storm ends with Christine slapping her husband several times, after which he goes out onto the balcony, overlooking the raging sea, to brood. The camera closes in on his twitching eyes before fading to black. The following day, a smattering of seagulls circle and caw as a body washes up on the shore. A young actor, Robert Tisdall (Derrick De Marney), walks along the cliffs, sees the body lying below, and rushes down to the beach. Upon realizing it is Christine (with whom he’d had a romantic relationship), he races away to find help. But two young women who see his flight misinterpret his motives, and when it is discovered that the actress was strangled with a belt that is found nearby, Robert is accused of murdering Christine. As they are questioning the young man, the police reveal that they believe the belt used to kill Christine belonged to a raincoat owned by Robert—which he claims was stolen from him before the murder. While being escorted to his first court appearance, Robert manages to slip away from the police and escapes, hiding in the car of Erica Burgoyne (Nova Pilbeam), the unwitting daughter of the chief constable. Erica (who had briefly tended to Robert after he fainted during interrogation) finds herself drawn to the young man, and soon agrees to help him clear his name. The two set out to discover who has framed Robert for the murder, and why. 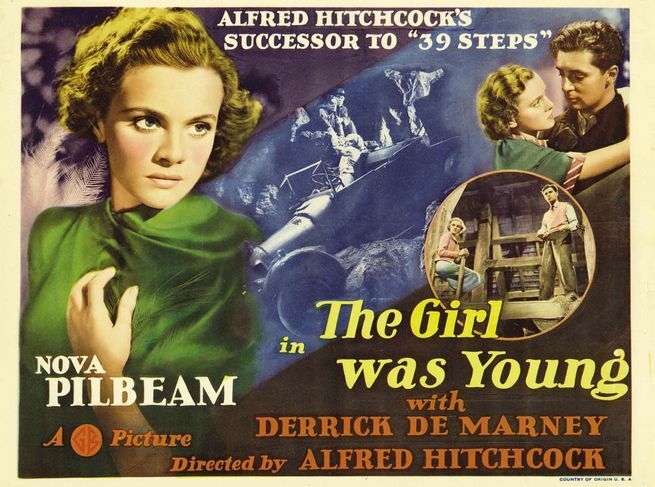 Considering that the murderer is more or less revealed to the audience in the first two minutes of the film, 1937’s Young and Innocent (released in the United States under the title The Girl Was Young) is not what you might call one of the more “suspenseful” films ever produced under the auspices of director Alfred Hitchcock. Nor is it the pinnacle of his output in Britain—that title would (in my opinion) go to the film that immediately followed this one, 1938’s The Lady Vanishes, which is a masterpiece on par with the director’s most superior American offerings. But Young and Innocent is an enjoyable, mild romantic thriller in its own right, and not nearly as well-regarded as it probably should be in comparison to other entries in Hitchcock’s wide-ranging filmography. Though he had been making films for more than a decade by that point, it is only toward the end of the 1930s when we begin to see the Hitchcock “touch” (to borrow a phrase more commonly associated with Ernst Lubitsch) take definitive shape. And in this film, we see some of the earliest hallmarks that would soon become synonymous with the director: the “wrong man” trope, in which a hapless bystander becomes embroiled in a conspiracy about which he knows little to nothing; the helpful girl accomplice, who becomes equally embroiled in the plot by reason of her association with the accused man; the subsequent imperilment of the helpful girl (as I’ve discussed before, Hitchcock loves his endangered heroines); and that unique mixture of sometimes-dry humor and mystery/suspense that makes Hitchcock’s movies so damned entertaining. Hitchcock has a decided fascination with examining characters that, through no fault of their own, are thrown into life-and-death situations in which their freedom and their lives are threatened. As such, Robert Tisdall is a sort of cinematic kin to figures such as Richard Hannay in The 39 Steps (1935), Barry Kane in Saboteur (1942), Manny Balestrero in The Wrong Man (1956), and Roger Thornhill in North by Northwest (1958). And while among the pantheon of Hitchcock leading ladies, Erica Burgoyne does not generally rank with the most memorable, there are shades of Erica in some of those later, more notable heroines: she’s young and resourceful, like young Charlie in Shadow of a Doubt (1943), and also willing to do what she can to help prove a man’s innocence, much like Saboteur’s Pat Martin and Spellbound’s (1945) Constance Petersen. The film is aided by an able cast, including several frequent Hitchcock actors such as Mary Clare, Basil Radford, and John Longden. Young and Innocent marks leading man De Marney’s first and only collaboration with the director; De Marney’s resume is relatively short, and his career peaked in the early 1940s, with infrequent film roles in subsequent years. It’s a shame his career didn’t really take off, because he’s quite appealing, at least in this role (and if we’re being honest, he’s not bad to look at, either). As for his equally delightful leading lady, seventeen-year-old Pilbeam, the film is her second and last appearance for the director, having previously played the kidnapped daughter in Hitchcock’s first version of The Man Who Knew Too Much (1934). Like De Marney, Pilbeam’s career was relatively short; after starring in a little over a dozen feature films in England, Pilbeam retired from the screen before the age of thirty (incidentally, Pilbeam is still alive and kicking at the age of ninety-two). Young and Innocent may not be the best Hitchcock has to offer in comparison to some of his more popular and critically-acclaimed films, but it is nonetheless a pretty fun romp (that is, aside from the unfortunate–though admittedly effective–use of blackface in the film’s climactic sequence). De Marney and Pilbeam make a charming pair, the story is fast-paced and interesting, and the movie features some great cinematography at the hands of Hitchcock’s regular British collaborator Bernard Knowles. And it’s fun to watch this movie and see connections to the director’s later work–whether those connections were intentional or not is anyone’s guess, but it’s interesting to speculate. Did the close-up shots of the seagulls circling over Christine’s corpse later inspire similar shots in The Birds (1963)? Was the spectacular crane-enabled single-take sequence at the film’s climax, which so effectively zeroes in on the killer’s twitching eyes, one of the inspirations for the famed “key” tracking shot in 1946’s Notorious? Did the scene in which Erica dangles over the edge of a mine shaft, holding onto Robert’s arm for dear life, inspire the fight on the Statue of Liberty’s torch in the final scenes of Saboteur? As I mentioned above, for some reason, the film was renamed The Girl Was Young when it was released in the United States in 1938, so if you are looking for the movie in this neck of the woods, you may find it under that title. It is readily available on a number of cheap DVD collections of Hitchcock’s early British films (including the one I own, which was a mere five bucks at the local Wal-Mart), and is also available for viewing on YouTube and for download through the Internet Archive. The copy I have is not the best quality (neither is the YouTube version, from what I can tell), but it’s at least watchable. Still, here’s hoping that Hitch’s British output is given the super-duper special DVD treatment and bright, shiny polish it deserves sometime in the near future. This week marks the third annual For the Love of Film blogathon, hosted by Self-Styled Siren, Ferdy on Films, and This Island Rod. In years past, the focus has been on film restoration; this year, the event will raise money to pay for temporary online streaming of the recently rediscovered 1923 Graham Cutts/Alfred Hitchcock collaboration The White Shadow on the National Film Preservation Foundation website, as well as the costs of recording a new film score by Michael Mortilla. If you have not already given to this most worthwhile cause, please click the link above and donate today. Every donation gets the NFPF one step closer to their goal of allowing all film fans the chance to see this long-lost classic. ← Movie memories from 1960s Memphis. I dig Young and Innocent. The collapsing mine is such a random disaster! It reminds me of the out of the blue plane crash at the end of Foreign Correspondent. Oh, and put me down as an admirer of that crane shot. I love it. Within Hitchcock’s catalogue, it probably ranks as a minor work, and perhaps rightly so, but that doesn’t mean it isn’t very entertaining, and as you say there are a number of shots that he seemed to go for again in later years. That single take crane shot was, by all accounts, a nightmare to pull off, but it adds so much to the scene and it’s obviously something Hitchcock loved right up until his later years e.g. that bit of trick photography where the camera backs out of Rusks’s flat in Frenzy. Good review. Impossible to dislike “Young and Innocent” with its appealing leads and sense of fun behind the adventure – and that amazing reveal. I like Hitchcock’s early British films because they’re — well, so British, if you will – I like their offbeat sense of humor and the quiet but meaningful way that characters interact with each other; plus I enjoy the glimpses we get of British life between the wars. I agree that his best work of this period is The Lady Vanishes, in which it all comes together. Glad to know Ms Pilbeam is still with us! Based on your description, this picture is going to the top of my must-watch list. Thanks! Never seen this Hitchcock film. However, by reading your description I see many of his trademarks are on display. Brandie, I remember watching YOUNG AND INNOCENT (a.k.a. THE GIRL WAS YOUNG) in my early teens, in the wee hours on our local public television station! While it seemed relatively low-key compared with the likes of SPELLBOUND and NORTH BY NORTHWEST, I still found it quite endearing, including little touches like the birthday party and the surprisingly suspenseful mine shaft scene. Now I’m interested in giving it another shot after all these years. Thanks for a very enjoyable post and for steering me back to a very likable film on the verge of Hitchcock’s amazing movies to come! Brandie – a very nice post about a fun movie. And never pass up the chance to see the forecer-young Nova Pilbeam! I adore Young and Innocent, a very underrated and overlooked film in Hitchcock’s suite of “wrong man” misadventures. Pilbeam is magnificent. I do think the raincoat MacGuffin doesn’t hold up well under close scrutiny, but it’s all so wonderfully constructed.